One of the reasons Eddy Morales decided to run for Gresham City Council is a conversation he had with a librarian. A spike in rent, which is something many in the community are facing, forced the librarian to be homeless for three months, as she was unprepared for the new expense. That feeling of instability is something Morales, 38, understands. He grew up with a single mother, moving to different homes across the region. He dropped out of high school after his brother was murdered, and was uncertain of his future. But support from his peers and community convinced him to return to school, leading him to be the first person in his family to graduate high school and attend college. Morales runs a public relations firm, and is active in political groups and volunteer organizations. He is on the National Gay and Lesbian Task Force, and many groups working to support the community and make positive changes for social justice. He is the treasurer of the Democratic Party of Oregon and lived in Washington, D.C., for 13 years, where he was the president of the U.S. Student Association and active in congressional and state elections. 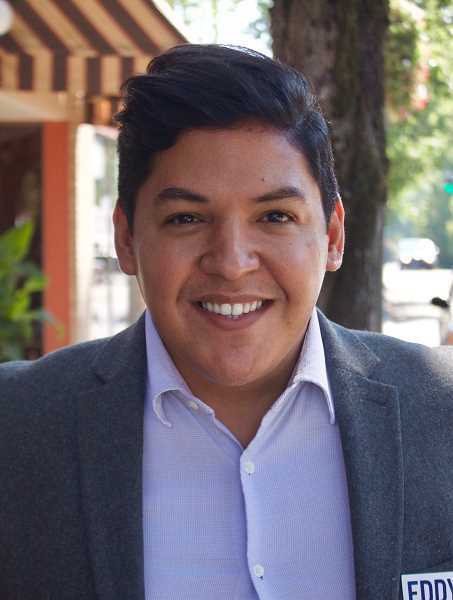 Now Morales, who bought a home in Gresham in 2010 and has been living locally full-time for the past six years, is challenging incumbent Kirk French for Gresham City Council Position 2. He sat down with The Outlook to talk about the upcoming election. The Outlook: Why are you running for City Council? Eddy Morales: I want to engage more people in the political process in Gresham. I know when people vote, it is the first thing they do to become civically engaged. I want to be the catalyst for people to participate by asking them to vote and volunteer. And I believe in my platform. Morales: The three things I am running on are housing insecurity, transportation equity and keeping families together and strong. Everyone should be in a home, and everyone should be able to stay in it. The moment we remove that insecurity from people's minds, it frees them to think of other things. It is unsettling to a community and city. We need to find a balance of renter and landlord rights. Gresham is a young city, so we need programs to help people buy their first home. Whether that is a 10-year tax abatement or waiving fees, it's a long-term investment. We should see more changes in zoning to have more mixed spaces — high-density, walkable neighborhoods. I am really happy with the current stuff being done on roads, but we still have work to do with active transportation. There are still places with no sidewalks, so we need to prioritize active transportation as much as we are potholes. That means creating sidewalks and bike lanes, and putting in safety crosswalks. Public transportation is also important, we need more bus lines out here. Finally, we need to reassure and ease the anxiety in the community that families are being separated. The city having the bully pulpit can calm people and do more positive reinforcement that we are nondiscriminatory. More after-school programing and tackling the homeless population, and developing a parks and rec department so families have something to do is also important. All of this would make the city more appealing. Gresham is a great place. I love living here. This isn't a critique, it's a vision. Morales: I think Councilor French is a good person, and the council has done good work, so I don't want this to be framed as I'm running against Kirk French, because I'm not. I am running for a set of ideals and ideas, with a vision for Gresham that resonates with the people who live here now. I represent the diversity that the city has — the growing younger population and the ethnic diversity. Outlook: Is there anything you would change about how the city or council functions? Morales: I would build in more time for citizen involvement and comment during meetings. Studies have shown that when people meet a public official it demystifies them and makes them feel approachable. We need to take City Hall to the people. Morales: I am really proud of the campaign we are launching. We have gotten so much support already because of the ideas and groundwork we are doing.